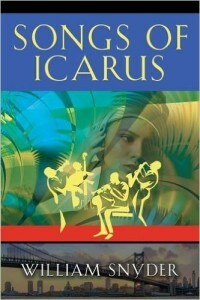 The following is a guest post by William Snyder, author of Songs of Icarus. If you would like to write a guest post on my blog, please send me an e-mail at contact@cecilesune.com. ‘Ancient Egypt’? I fell in love with modern Alexandria on a sensual basis reading Lawrence Durrell’s Alexandria Quartet a while ago. Rarely has a writer captured the spirit of a city quite the way he did. Whenever I smell lemons I still think of Durrell’s descriptions. Bradbury’s book and the smell of ‘ancient Egypt’ most likely came from the library there. It’s hard to imagine a conversation between Ray Bradbury and Larry Durrell. Ray roller-skated through the streets of LA in the 30’s and lived at home while Larry coerced his mother and siblings to move with him and his bride to Corfu in the Mediterranean. Bradbury married the only woman he ever dated; they stayed together for 56 years and had 4 daughters while living in Los Angeles. Durrell married 4 different women living in Greece, the Middle East, and England before ending his days in France. So what’s going on in my addled brain that correlates Ray Bradbury and Lawrence Durrell with Alexandria? Obviously it starts with “Justine,” “Mountolive,” “Balthazar” and “Cleo.” Durrell’s Alexandria Quartet used Einstein’s theory of relativity and Freudian psychoanalysis as cornerstones of a work that dealt with love in so many forms. Alexandria as the cultural crossroad of ancient Greece and Egypt, was the perfect setting for such an ambitious work. Bradbury wrote an early version of Fahrenheit 451 called “The Firemen” in UCLA’s Powell Library. His family couldn’t afford college tuition so he spent 3 days a week at the library. “Libraries raised me,” was his conclusion regarding the education they provided him. Can I draw a parallel between the book burning of Fahrenheit 451 and the burning of Alexandria’s library? Of course I can. It’s OK to say I’m crazy I don’t mind. The Mouseion (Temple of the Musses) is considered a model for the conceptual structure of the University. As part of the Mouseion Alexandria’s library was an information storehouse. The library was one of the great achievements in human history. Its mission was to compile all knowledge in one place. Today the San Francisco-based Internet Archive is a conscious attempt to recreate the library of Alexandria in digital format. 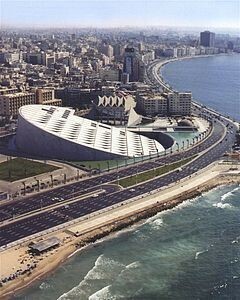 On the right is what the Bibliotheca Alexandrina looks like today. In an attempt to foster education and communication with the Arabic community and heritage I suggest checking out the Bibliotheca Alexandrina website. William Snyder (1941 - ) was born, raised and educated in Philadelphia. He began teaching English before becoming a computer programmer and consultant. He returned to teaching Computer Systems Management and Programming at university then followed his dream to become a writer. He has been published in a variety of e-zines and literary/technology journals along with “La Mujer Con Ojos Negros” in 29; An Anthology of Memoirs and Short Stories and “Lieutenant” in The Merida Review. He currently resides in Denver, CO.